With the release of Hemp Bombs CBD Vape Tank Cartridges, we thought it was essential to provide our audience with more information on the product. Vape Cartridges, also known as vape pen cartridges and pre-filled vape cartridges, are simple vaping alternatives to devices such as mods. 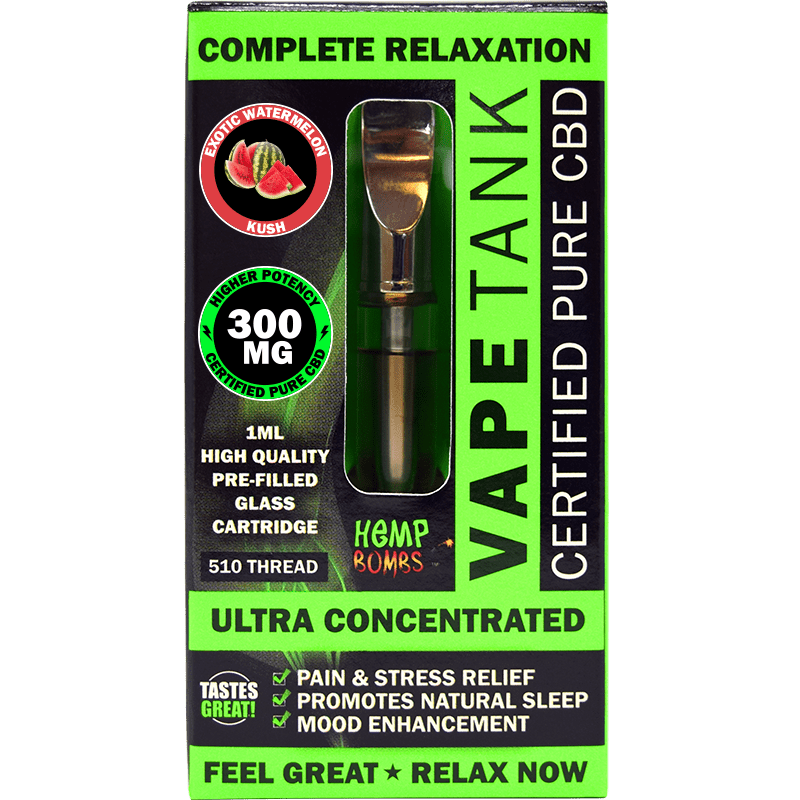 If you are a person who vapes but wants to simplify your experience as much as possible, please read on to learn more about Hemp Bombs Vape Tanks. In brief, vaping is the act of inhalation involved with a vaporizer or electronic cigarette. Unlike a cigarette though, vaping does not produce tobacco smoke. Vapor is created from materials like e-liquids, concentrates, and dry herb. Hemp Bombs vape products consist of 70/30 VG/PG split and a concentrated dose of CBD which can be beneficial to your health. At this point, Hemp Bombs customers will be able to vape on our selection of CBD E-Liquids, E-Liquid Additives or CBD Vape Tanks. Now, many different types of devices will materialize your e-liquid (or other substance) into a vapor. These vape devices are primarily broken up into three categories. Below, we break down the difference between Mods, Cig-a-Like, and Vape Pens. Mods are the largest and most customizable of all vape devices. They have a large battery - typically 3.7 volts - and are shaped in a box or as a tube. Like vape pens, they involve the push of a button. However, with mods, you can also adjust things like voltage, liquid consumption, and temperature. These devices are the smallest of the vaping devices and most closely resemble smoking a cigarette. Cig-a-likes are available in disposable and refillable forms and have relatively short battery life. They also store a relatively small amount of e-liquid. Compared to Cig-a-Likes, Vape Pens have larger batteries and are more customizable. They consist of many parts which can be swapped out, including coils. Typically, users have to hold down a button while inhaling, which gives the user more control over the throat hit. 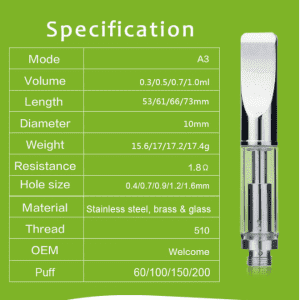 Tank: The section of the device containing wicks, e-liquid, and heating coils. Coils: Coils are a replaceable wire that is wound into a spring-like, coil shape. The coils are heated and turn the e-liquid into a vapor. Battery: The battery powers the device, sending energy to the atomizer to heat the e-liquid. E-Juice: A mixture of propylene glycol and vegetable glycerin that help create the vapor. Vape Cartridges, however, is one of the newest forms of vape device that offer simplicity at a lower cost. Vape Cartridges, or pre-filled vape cartridges, are popular among THC users and individuals whose preference is CBD. There are primarily two types of vape cartridges, vapes with batteries and vapes without batteries. 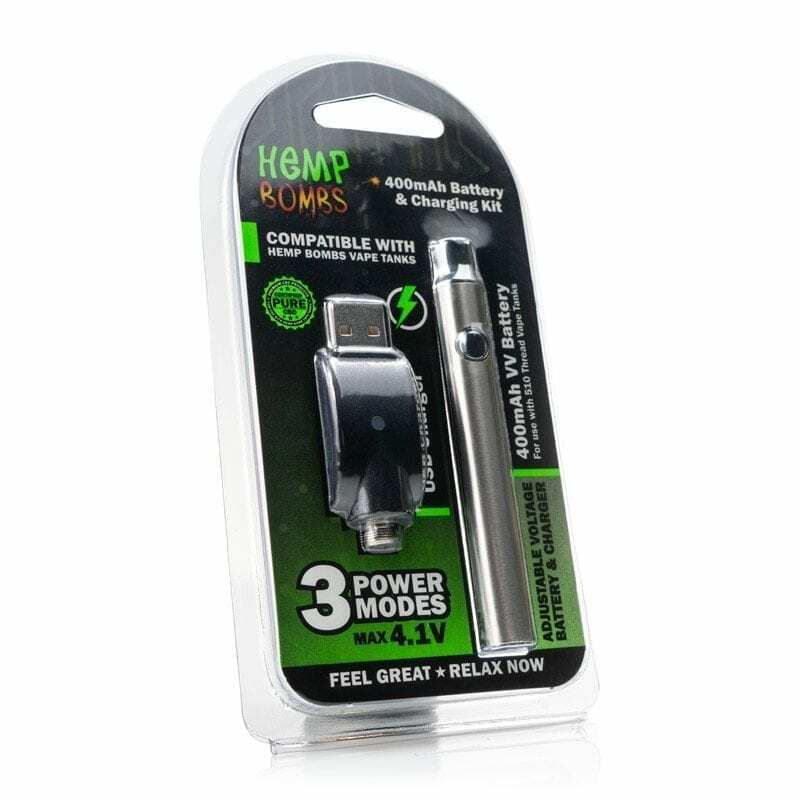 No-battery vape cartridges are typically fitted with a 510 threading, which connects to almost all batteries. An exception to this rule is companies who manufacture disposable (non-battery) cartridges that only fit with their batteries. Disposable batteries are a way for companies to try to squeeze more money out of the consumer. “Disposable” cartridges come equipped with batteries that have a charge that lasts the whole tank. With this kind of cartridge, there is no need for charging and no threading. These are one-use cartridges. Now that we have given an overview to Vape Cartridges, it’s time to talk more specifically about Hemp Bombs Vape Tank product. Hemp Bombs Vape Tank is a non-batteried vape cartridge with a universal 510 thread. Hemp Bombs Vape Tank Cartridges have a 1ml volume and the other largest specifications on that sheet. One feature that is important to address is Hemp Bombs Vape Tanks are dual-coil cartridges. Remember, coils are a replaceable wire that is wound into a spring-like, coil shape. The coils are used to heat and turn the e-liquid into a vapor. With dual, or two coils, there are a couple of advantages. First off, dual coils produce more vapor than single coil setups. Dual coils work well with Hemp Bombs’ heavy VG e-liquids. The reason dual coils produce more vapor, or “clouds,” is because of the amount of contact area between the e-liquids and coils. Also, dual coil configurations deliver that same amount of vapor in a shorter time and slow down heating time. If you are a person that wants to give your standard vape device a rest or just getting into vaping, a vape cartridge could be a good option. In comparison with other vaping devices, pre-filled vape cartridges will cost less, be more discrete, and have a more straightforward operation. If you are looking for a vape cart, look no further than Hemp Bombs. Our pre-filled cartridges are available in 11 flavors and three concentrations of premium CBD. At Hemp Bombs, we make vaping effortless.